At the Stapleton Law Office in Rogersville, Tennessee, we want to help you obtain justice for your serious legal challenge and secure the finances you need to support yourself and your family in the wake of a debilitating injury or devastating loss. In addition to offering unmatched advocacy for those dealing with serious personal injury claims, our law firm offers exceptional support for those trying to secure their rightful workers' compensation and Social Security Disability benefits, and we provide aggressive, effective defense counsel for those facing any type of felony or misdemeanor criminal charge. Established by highly rated attorney Mark Stapleton, our law firm has served the residents of Hawkins County and the rest of Northeast Tennessee for more than 30 years. During that time, we have earned a reputation for delivering the personalized attention our clients deserve while helping them obtain the most favorable outcome possible for their serious and pressing legal challenges. As one of the few attorneys in Tennessee certified by the National Board of Trial Advocacy as a civil trial specialist, Mr. Stapleton has achieved unprecedented success fighting for the rights and entitlements of those we serve. Through our personal injury practice, Mr. Stapleton has secured many substantial awards and settlements for our plaintiff personal injury clients, including the first and only seven-figure verdict ever awarded in Hawkins County for a personal injury claim. To begin the process of receiving the highest level of service and support for your scary and uncertain situation, you can contact the Stapleton Law Office by phone or through our law firm's website to schedule a free initial consultation. Any kind of truck accident is dangerous and can leave victims seriously injured. If you or a loved one has been involved in a truck accident, it is important to contact an experienced attorney right away to get the representation you deserve. To find the true cause of your car or truck wreck law firm conducts a thorough investigation. We visit the scene of the accident to look for evidence. We interview witnesses to the accident, review police reports and consult with professionals. Our work often reveals other factors that are critical to your case - factors like dangerous road conditions. We hold municipalities, cities, contractors, engineers and other parties accountable for the dangerous roads they created. Applying for workers' compensation can help you keep your life on track while you recover from your injury, but the process is often complicated and employers can make it tougher than it should be to get the compensation you need. 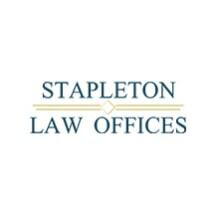 At the Stapleton Law Office we look at every angle of your case. We interview witnesses, review accident reports and investigate the scene of the accident. Sometimes our work reveals that defective machinery is the true cause of your injury.